Inserts for Wood or Wood Inserts are made from Free Machining, Free Cutting, Leaded Brass, 300 Series Stainless Steel or Aluminium which are Passivated and Tested to ASTM Standard. Wood Inserts are available in any metric or imperial sizes as per custom specification. Wood Inserts feature broad external threads that provide exceptional holding power in some of wood material composition. Inserts for Wood are classified in Flush and Flanged designs. 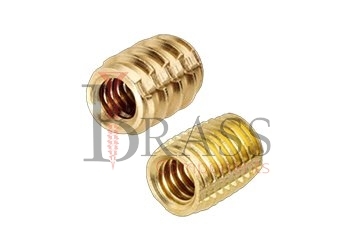 Wood Inserts machined out of brass, Available in single, double or triple designs for varying material thickness. Wood Inserts are easy to Install. Inserts for Wood use a proprietary external knife thread to slice into the wood, which provides superior holding power. Permanent fastening is achieved on Wood Inserts by distributing stress over a greater surface area. Minimizing the possibility of splintering, splitting and thread erosion. Wood Inserts meet RoHS Requirement and UL Listed. Wood Inserts designed to prevent stripping and thread erosion. Provide superior holding power in all applications. Wood Inserts are ideal for use wherever assembly or disassembly could lead to thread erosion or stripping. Full Thread Engagement for maximum control during installation. We manufacture Wood Inserts as per Custom Specification and export in Germany, Spain, Netherlands, Portugal, UK and other European Countries. For more Information, Please Contact Us or Inquiry Now.